Sleek EMS Ambulance racer ride-on scoot-ster is ready for that next emergency call! Features vintage ambulance detailing, working steering wheel and rubber wheels, and its heavy gauge steel construction is built to last. 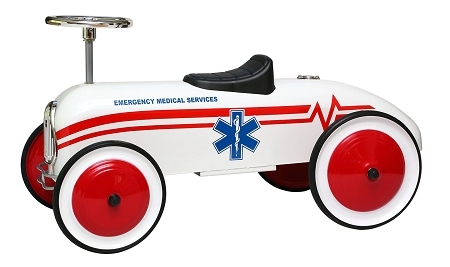 Don't forget our Personalized EMS Ambulance Racer is the perfect gift for the child of a Paramedic or EMT!